Today I am bringing you one of my favourite reviews so far of you've guessed it, CHOCOLATE. I am a self confessed chocoholic and have been from pretty much as far back as I can remember, so I literally jumped at the opportunity to try out some yummy treats from Chocolat Chocolat who do a range of handmade chocolate goodies. I had the awesome task of building 3 "create your own" bars* which could either be from their suggested selections for ease or completely bespoke using all the menu options available which is what I opted for. 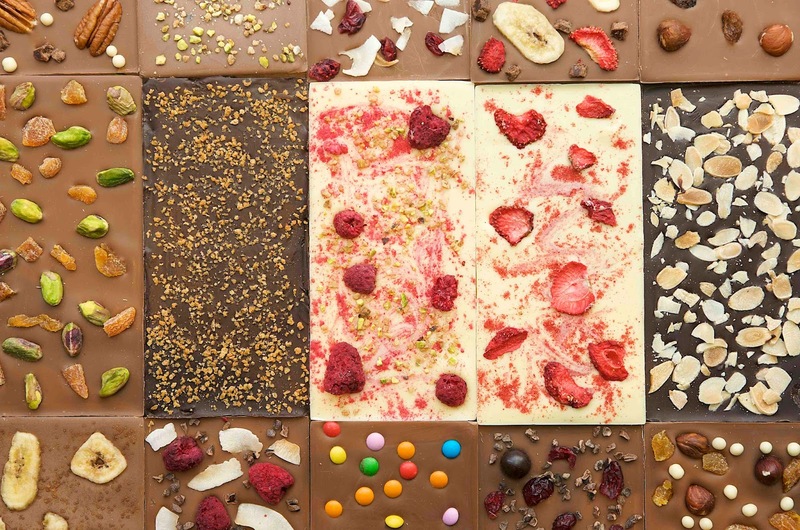 They have so many choices, you pick everything from the bar itself ( dark 70%, dark 50%, milk, caramel and white chocolate) and then up to 3 toppings per bar out of fruit, nuts, confectionary, spices, herbs, flowers, decoration and wording categories. I think my favourite was the buttons bar, but they were all really yummy. The milk chocolate is nice and creamy without being too sweet and I think the novelty of picking your own toppings is fantastic! If you want to check out the options, head on over to http://www.chocolatchocolat.co.uk/ for varieties/prices. If you were to order a bar, what toppings would you pick? Tell me in the comments. That chocolate looks amazing. Milk and choco crunch, fudge brownies and marshmallows looks so good! These look delicious, especially the last one! Just had a look on their website and I'd probably go for 70%dark chocolate (all the way) with walnuts and brownie pieces. Mmmm hungry thinking about it. it all looks very yummy.